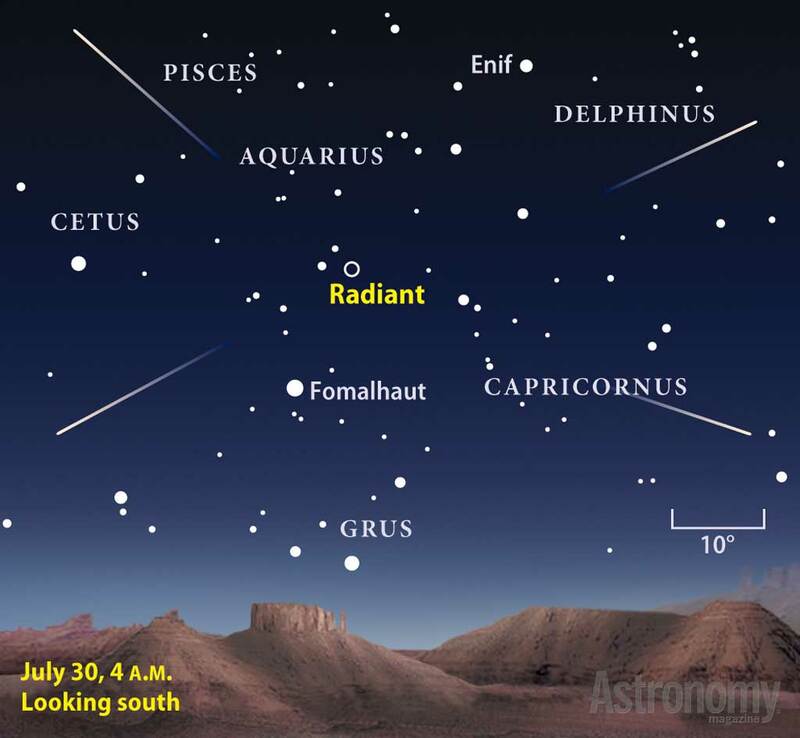 July highlights a few meteor showers, however, none ascents to significant status. The Piscis Austrinids and Alpha Capricornids delivering a maximum of 5 meteors for each hour at their late July peak, however, Southern Hemisphere observers will have better perspectives. The Alpha Capricornids are active for over a month lasting from July 6 through August 10. Unlike most showers, the Alpha Caps have a plateau-like maximum with maximum activity lasting from July 25-30. Since maximum activity is still 2 weeks away, hourly rates will be less than 1 no matter where you are located. 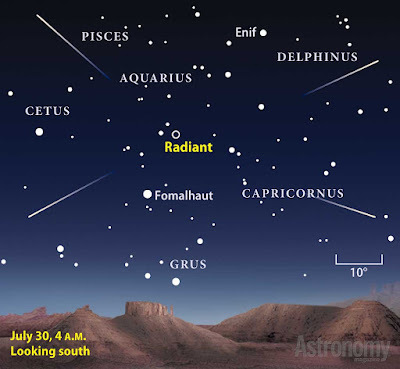 The radiant is currently located in the area of the sky that is located in northeastern Sagittarius, roughly 3 degrees north of the 4th magnitude star known as Rho 1 Sagittarii. The radiant is best placed near 0100 hours local daylight time (LDT) when it lies on the meridian and is highest in the sky. With an entry velocity of 22 km/sec., the average Alpha Capricornids meteor would be of slow velocity. Radiant of the Southern Delta Aqaurid meteor shower. The month's best performer is the Southern Delta Aquarid meteor shower, which ordinarily delivers 15 to 20 meteors for every hour. Sadly, the shower peaks the morning of July 30th, one day preceding the month's second full moon. The event does keep up its crest level for a few days so meteor watchers will get a better show on the off chance that they observe within the hour or two in the middle of moonset and the beginning of morning dusk of July 27th and the 28th. The Delta Aquariids get their name because their radiant appears to lie in the constellation Aquarius, near one of the constellation's brightest stars, Delta Aquarii. There are two branches of the Delta Aquariid meteor shower, Southern and Northern. The Southern Delta Aquariids are considered a strong shower. The shower originated from the breakup of what are now the Marsden and Kracht Sungrazing comets. Meteor showers can provide fun for astronomy education projects such as visual meteor observing as described in last April's post, "Methods for Observing the Lyrid Meteor Shower".